bakcang, bacang, zang, nom asom, Pya Htote , "Joong"
Zongzi (Chinese: 粽子; pinyin: zòngzi), or simply zong (粽; zòng), is a traditional Chinese food, made of glutinous rice stuffed with different fillings and wrapped in bamboo, reed, or other large flat leaves. They are cooked by steaming or boiling. In the Western world, they are also known as rice dumplings, or sticky rice dumplings. As it diffused to other regions of Asia over many centuries, zongzi has become known by various names in different languages and cultures. Pya Htote in Burmese-speaking areas (such as Myanmar), Nom Chang in Cambodia, and Bachang or Khanom Chang in Laos and Thailand. Vietnamese cuisine has also copied this dish as Bánh ú tro or Bánh tro. In Singapore, Indonesia, and Malaysia, zongzi is known as bakcang, bacang, or zang (from Hokkien Chinese: 肉粽; Pe̍h-ōe-jī: bah-chàng), as Hokkien is commonly used among overseas Chinese. Similarly, zongzi is more popularly known as machang among Chinese Filipinos in the Philippines. Zongzi (sticky rice dumplings) are traditionally eaten during the Duanwu Festival (Dragon Boat Festival), which falls on the fifth day of the fifth month of the lunar calendar (approximately late-May to mid-June). A popular belief amongst the Chinese of eating zongzi involved commemorating the death of Qu Yuan, a famous Chinese poet from the kingdom of Chu who lived during the Warring States period. Known for his patriotism, Qu Yuan tried unsuccessfully to warn his king and countrymen against the expansionism of their Qin neighbors. When the Qin general Bai Qi took Yingdu, the Chu capital, in 278 BC, Qu Yuan's grief was so intense that he drowned himself in the Miluo river after penning the Lament for Ying. According to legend, packets of rice were thrown into the river to prevent the fish from eating the poet's body. Although it may have originally been a seasonal food, zongzi are available year-round in most major cities with a significant Chinese population. 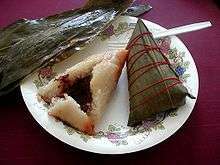 The shapes of zongzi vary, and range from being approximately tetrahedral in southern China to an elongated cone in northern China. Wrapping a zongzi neatly is a skill that is passed down through families, as are the recipes. Making zongzi is traditionally a family event of which everyone helps out. While traditional zongzi are wrapped in bamboo leaves, the leaves of lotus, reed, maize, banana, canna, shell ginger and pandan sometimes are used as substitutes in other countries. Each kind of leaf imparts its own unique aroma and flavor to the rice. The fillings used for zongzi vary from region to region, but the rice used is almost always glutinous rice (also called "sticky rice" or "sweet rice"). Depending on the region, the rice may be lightly precooked by stir-frying or soaked in water before using. In the north, fillings are mostly red bean paste and tapioca or taro. Northern style zongzi tend to be sweet and dessert-like. Southern-style zongzi, however, tend to be more savory or salty. Fillings of Southern-style zongzi include salted duck egg, pork belly, taro, shredded pork or chicken, Chinese sausage, pork fat, and shiitake mushrooms. Zongzi need to be steamed or boiled for several hours depending on how the rice is made prior to being added, along with the fillings. However, as the modes of zongzi styles have traveled and become mixed, today one can find all kinds of zongzi at traditional markets, and their types are not confined to which side of the Yellow River they originated from. "Jiaxing zongzi" (嘉兴粽子): It is one famous kind of zongzi in mainland China named after the city Jiaxing. The filling is typically pork but also can be mung beans, red beans or salted duck eggs. Jia zong (假粽): Instead of glutinous rice, balls of glutinous rice flour (so no individual grains of rice are discernible) are used to enclose the fillings of the zongzi. These zongzi are typically smaller than most, and are much stickier. Jianshui zong (碱水粽): Meaning "alkaline water zong," these are typically eaten as a dessert item rather than as part of the main meal. The glutinous rice is treated with lye water (aqueous sodium hydroxide), or potassium carbonate, giving them their distinctive yellow color. Jianshui zong typically contain either no filling or are filled with a sweet mixture, such as sweet bean paste. Sometimes, a certain red wood sliver ( 蘇木 ) is inserted for color and flavor. They are often eaten with sugar or light syrup. Nyonya Bachang / Nyonya zong (娘惹粽): A specialty of Peranakan cuisine, these zongzi are made similarly as southern zongzi. However, the filling is typically minced pork with candied winter melon, ground roasted peanuts, and a spice mix. Taiwan zongzi (臺灣粽): The northern Taiwanese zongzi (北部粽) are wrapped with husks of "Phyllostachys makinoi" bamboo (桂竹籜), then steamed; southern Taiwanese zongzi (南部粽) are wrapped with leaves of Bambusa oldhamii (麻竹葉), then boiled. 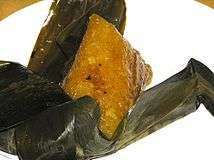 Filipino Machang is a Filipinized version of zongzi,common in Chinoy (Chinese Filipino) communities. 1 2 3 4 "The Legend of Zongzi (Sticky Rice Wrapped in Bamboo Leaves)". KCET. June 19, 2015. Retrieved November 5, 2016. ↑ Roufs, T.G. ; Roufs, K.S. (2014). Sweet Treats around the World: An Encyclopedia of Food and Culture. ABC-CLIO. p. 81. ISBN 978-1-61069-221-2. Retrieved November 5, 2016. ↑ "Zongzi fever". Global Times. June 11, 2015. Retrieved November 5, 2016. ↑ The origin of zongzi Archived May 15, 2007, at the Wayback Machine. 1 2 3 4 Schmidt, A.; Fieldhouse, P. (2007). The World Religions Cookbook. Greenwood Press. pp. 27–28. ISBN 978-0-313-33504-4. Retrieved November 5, 2016. ↑ Thurman, Jim (June 9, 2016). "Where to Find Chinese Zongzi, the Sweet Pork-Filled Tamales Wrapped in Bamboo". L.A. Weekly. Retrieved November 5, 2016. 1 2 3 4 5 6 Liao, Y. (2014). Food and Festivals of China. China: The Emerging Superpower. Mason Crest. p. pt68. ISBN 978-1-4222-9448-2. Retrieved November 5, 2016. ↑ Jing, J. (2000). Feeding China's Little Emperors: Food, Children, and Social Change. Stanford University Press. p. 105. ISBN 978-0-8047-3134-8. Retrieved November 5, 2016. ↑ Mayhew, B.; Miller, K.; English, A. (2002). South-West China. LONELY PLANET SOUTH-WEST CHINA. Lonely Planet Publications. p. 121. ISBN 978-1-86450-370-8. Retrieved November 5, 2016. 1 2 Gong, W. (2007). Lifestyle in China. Journey into China. China Intercontinental Press. pp. 12–13. ISBN 978-7-5085-1102-3. Retrieved November 5, 2016. 1 2 Stepanchuk, C.; Wong, C.C. (1991). Mooncakes and Hungry Ghosts: Festivals of China. China Books & Periodicals. p. 47. ISBN 978-0-8351-2481-2. Retrieved November 5, 2016. 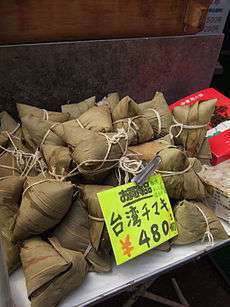 Wikimedia Commons has media related to Zongzi.